As a kid, I played baseball in the field behind my GrandmaÃ¢â‚¬â„¢s house. We played every day, all day, and each day for lunch, my Grandma made us her world-famous peanut butter sandwiches. These were beautiful: a single piece of toast with a thin layer of peanut butter spread on top. ThatÃ¢â‚¬â„¢s simple enough, but what made them special was she wrote your name into the peanut butter so you knew THIS one was yours. I snuck into the house, removed the ball from its case without making a sound, and went back down to the field to play. A few hours later, Grandma came out, asking to see the ball. What I didnÃ¢â‚¬â„¢t know was this ball was a gift from my Grandpa. HeÃ¢â‚¬â„¢d got it signed by Ted Kluszewski, GrandmaÃ¢â‚¬â„¢s favorite Red, when he was on a business trip some years ago. As the story goes, Grandpa carried that ball with him everywhere that trip. He was so excited to give it to her. Only he never got the chance. Grandpa had a heart attack and died in hotel room. They found the ball in his suitcase, his last gift to her. Now, because of me, it was covered in dirt and scuff marks. The signature was gone. When I handed it to my Grandma, she started to cry. Ã¢â‚¬Å“Life is hard,Ã¢â‚¬Â I thought. Ã¢â‚¬Å“Eventually someone will hurt you.Ã¢â‚¬Â I heard that speech hundreds of times growing up, but I never thought I would hurt Her. The next day was rough. I struck out six times before lunch break and, when everyone went up for their sandwiches, I hung back, sitting on a swing set nearby. I was too ashamed to go in. Grandma came out later and sat next to me. Ã¢â‚¬Å“IÃ¢â‚¬â„¢m sorry, Grandma,Ã¢â‚¬Â I said. Ã¢â‚¬Å“I know,Ã¢â‚¬Â she said. Ã¢â‚¬Å“I have something for you.Ã¢â‚¬Â She gave me a plate with two peanut butter sandwiches on it. The first one said my name. The second: I forgive you. I took that sandwich like communion and smiled. Grandma smiled, too, and just like that, everything was alright. All the guilt I felt, all the pain I caused melted away with those three beautiful words: I forgive you. It felt like freedom. Later that day, we put the ball back in its case, scuff marks and all. You could still see hints of the signature if you looked close enough. We knew it was there, hiding somewhere underneath the dirt, and that made all the difference. Baseball and forgiveness are sticky, like a peanut butter sandwich. They stick with you. This story has stuck with me most of my life. 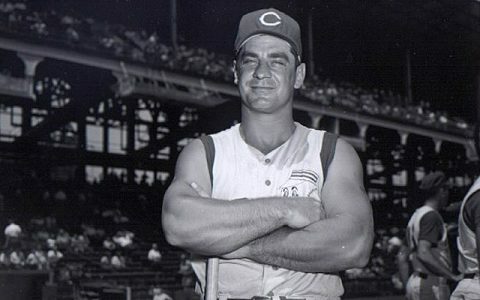 WeÃ¢â‚¬â„¢d mention it every now and again at Family dinners, holidays, or when watching a Reds game on television and someone with big arms and cropped sleeves came to the plate. Grandma would pull the ball out at the start of each season to remind that, while baseball is fun, there are sometimes things that matter more. This lesson came back to me a few years ago. Grandma was out for a drive one day, when someone ran a stoplight at twice the speed limit and broadsided her. The paramedics worked frantically to save her, but she died on the way to the hospital. The other driver, a college kid named Emily, walked away from the accident without a scratch. Sometimes life just isnÃ¢â‚¬â„¢t fair. Is it? A few months later, the local high school had a traffic safety seminar and Emily was listed as one of the speakers. You better believe we went. Mom was oddly quiet about it, but the rest of us? We wanted to see this Monster face to face. But I think something changed, for all of us, when Emily got up to speak. What we saw, in that moment, was Emily wasnÃ¢â‚¬â„¢t this Monster weÃ¢â‚¬â„¢d made her out to be. She was a scared kid, sitting alone on her own swing set, just like me when I was a kid. Only now, there was no one to come out, sit next to her, and make it all better. Emily lowered her head in shame, but my Mom didnÃ¢â‚¬â„¢t stop there. Ã¢â‚¬Å“I heard what you said, and if SHE were here, sheÃ¢â‚¬â„¢d want you to have this.Ã¢â‚¬Â Mom reached into her purse, and pulled out a little baggie with two peanut butter sandwiches in it. On the first one, she wrote the name Emily. On the second: I forgive you. Emily took that sandwich like communion and smiled. Mom smiled, too, and just like that, everything was alright. They couldnÃ¢â‚¬â„¢t bring my Grandma back, but both women could finally move on. ThatÃ¢â‚¬â„¢s what forgiveness does. It lets you move on. It makes you free. You canÃ¢â‚¬â„¢t lead a life of peace unless youÃ¢â‚¬â„¢re willing to forgive, and thatÃ¢â‚¬â„¢s what my Grandma taught us. ThatÃ¢â‚¬â„¢s what she left us: a beautiful legacy of forgiveness for me, my Mother, my friends on the baseball field, even Emily. I keep the dirty baseball with Ted KluszewskiÃ¢â‚¬â„¢s ghost signature on a shelf in my office as a reminder of that legacy. And, now, all of those whoÃ¢â‚¬â„¢ve shared in that legacy would like to pass it on to you. Life is hard, eventually someone will hurt You. When that happens, you get to choose. Will you fight back? Or will you share the beauty and the freedom of baseball, forgiveness, and peanut butter sandwiches? Wow…I have no words. What an amazing and emotional story. You are an incredible writer! Your equally amazing grandmother would be proud. Great story Joe. Made my eyes misty this morning. Life’s lessons come in many forms. Sometimes in the form of peanut butter sandwiches. Priceless. Thank you, very, very much for writing this. This is the finest piece of writing I’ve come across on this site & quite a powerful story. Great Story. Thanks For sharing! Let us all take this lesson seriously. You’ve done it again Joe. Just when I thought you couldn’t do better than you’re last piece. You’ve really got a gift for getting what you feel from your heart, through your brain, and onto the paper…er… screen. Just great stuff Joe. Thank you. Still so touching. Thanks again for showing us how you became so awesome. Such gracious women in our lives! This is nice. Very well written. Thanks for sharing. What an amazing legacy that your grandmother passed on. And now you and your mother have passed it on as well. God bless you & thanks for sharing the beauty of the decision over the emotion. Great, great message, Joe, thanks for sharing. Yeah that was an amazing story. Wow I was choked up reading it. Phenomenal. Thank you, Joe. The world craves to hear and remember more of these stories, and while the internet and social media have made it easier for negative messages to spread and seemingly rise in prominence, it’s great to remember that those same tools allow for the greater proliferation of peanut butter sandwich stories, as well. May we all learn to better live in communion today! Holy crap. I didn’t expect to read anything like this today, honestly. Great story. I couldn’t help but wonder – how do you write on a peanut butter sandwich? Is that symbolic or were letters actually written on it somehow? Open-faced, and “written” in the exposed peanut butter. Yeah. It’s a single piece of toast with peanut butter on top. She scratched it out with her pinky finger. Funny thing was … shortly after she died, we all gathered on the porch behind my aunt’s house (where she lived at the time), and when I shared the story about PBS, several of my cousins, aunts, and uncles had similar stories. Thanks for the kind comments everyone. I’m glad you liked it. Wonderful piece, Joe. It brought back memories of my own grandmother, who I lived with until I was 6 years old and love dearly. Can’t thank you enough.. Thank you for sharing such a heartfelt story. I loved this story too, Joe. Thank you very much.